This production collaboration is an impressive adaptation of the Rockeye custom design put into a Protech automatic configuration. It has a black D2 steel blade with a plain edge. The front side of the blade bears the Protech logo, while the back side has the George cross. The handle is 6061-T6 aluminum with a knurled handle front. 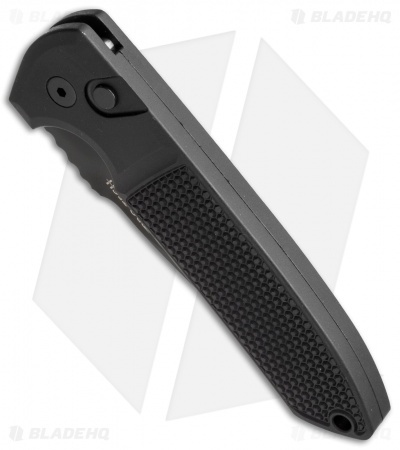 The Rockeye is outfitted with a tip-up carry pocket clip. This is a Protech, so the action, lockup, fit and finish are all top-notch. 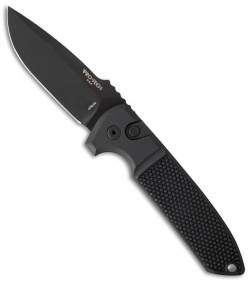 I'm a Protech fan, so I'm not completely unbiased, but wow, what a knife. The action is extremely fast and powerful. It locks up with a rock-solid "thunk" that sounds awesome. It makes you wonder if/how they think about the sound these knives make, because it just looks, feels and sounds like it's ready for anything. Knurling is great. Clip is perfectly functional, although I took mine off because I really don't need it and it bugs me when it snags at my clothes or digs into my hand. That's just a preference thing. A touch of lubricant on the plunger made it nice and smooth. Handle is 5" in length, but I easily carry all the time. And sharp? Forget it. Holy cow. Great, great knife.